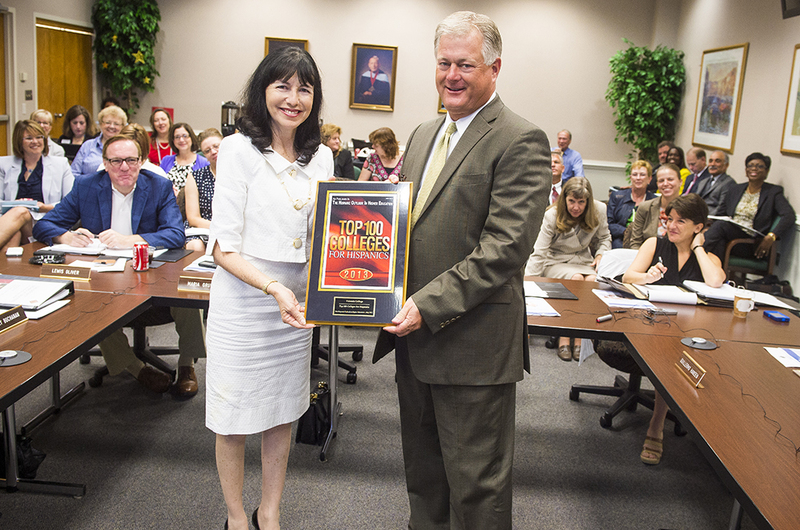 Orlando, FL – Valencia College ranks 17th in the nation for the number of degrees awarded to Hispanic college students, according to the annual Top 100 Colleges for Hispanics list. The Top 100 Colleges for Hispanics list is published by The Hispanic Outlook in Higher Education magazine. The magazine staff highlights the colleges and universities with the largest Hispanic enrollments and the colleges and universities where the most Hispanics receive undergraduate and graduate degrees. The rankings were compiled using data from the U.S. Department of Education’s National Center for Education Statistics. The magazine relied on data submitted for 2011. Valencia was ranked 17th in degrees awarded because, of the 6,627 degrees the college awarded in 2011, 1,674 (or 25 percent) were awarded to Hispanic students. In addition, Valencia College ranked 18th in the nation in the number of Hispanic students enrolled. Of Valencia’s 42,631 students enrolled in 2011, 30 percent – or 12,901 – were Hispanic. Also, Valencia was ranked 26th in the nation based on the number of Hispanic students enrolled full-time. Of the 17,759 students enrolled at Valencia full-time in 2011, 31 percent — or 5,537 – were Hispanic. Valencia is one of 356 colleges and universities recognized by the U.S. Department of Education as a Hispanic Serving Institution (HSI). Defined as nonprofit degree-granting institutions with full-time equivalent undergraduate enrollments that are at least 25 percent Hispanic, HSIs educated more than 1.4 million Hispanic undergraduates and graduates in 2011-12. These institutions represent 10.5 percent of the nation’s nonprofit colleges and universities, but serve 56 percent of all Hispanic students. In 2011, there were 52.5 million Hispanics living in the United States, plus an additional 3.5 million in Puerto Rico. Hispanics represent 17 percent of the U.S. population and their numbers have grown 45.5 percent from 2000 to 2011, the largest growth among all population groups.